Whereas majority of accredited election monitors hailed the performance of the Independent National Electoral Commission (INEC) in the Osun guber election on Saturday, many political and legal pundits shared divided views over the planned September 27th governorship rerun. Already, the Peoples Democratic Party (PDP) has rejected the declaration of the results inconclusive, saying it is alien to the spirit of the Constitution and electoral Act as amended. The cause of the rerun is linked to the cancellation of 3,498 votes recorded in the troubled polling units which according to the Electoral Act are higher than the number of valid votes separating two biggest winners. Recall that the candidate of the Peoples Democratic Party (PDP) , Ademola Adeleke, had polled 254,698 votes to defeat that of the All Progressives Congress (APC), Gboyega Oyetola, who polled 254,345 votes. According to INEC’s Standing Rules at the commission’s headquarters in Osogbo, the state capital, the Returning Officer and Vice-Chancellor of the Federal University of Technology, Akure, Prof Joseph Fowape, said since the margin between the two leading candidates was lower than the registered cancelled votes, the election had to be declared inconclusive and another date given for rerun. Areas marred with irregularities include polling units in Ife North, Ife South and Orolu local government areas where cases of card reader malfunctioning, ballot box snatching, among others, led to the cancellation of 3,498 votes. However, a Lagos based legal expert who pleaded for anonymity quoted relevant section of the Electoral as amended that “Where no candidate gets the required spread, the Commission shall within seven (7) days of the result of the election arrange for another election between the candidate who scored the highest number of votes at the election and one among the remaining candidates who has a majority of votes in the highest number of States. Where there are more than one candidate with a majority of votes in the highest number of States, the candidate with the highest total of votes cast at the election shall be the second candidate for the election”. According to him, “There is no need for all the contestants going for the rerun, rather rerun in such circumstance shall be only for the two leading contestants and all”. Another lawyer added that “If the margin between the 1st and the 2nd is less than the voided/cancelled votes, there will be a rerun, but if the margin is greater than the voided votes, the 1st will be declared the winner. The margin is 353 while the voided is 3768”. Also speaking, a human right activist and lawyer, Dr West Idahosa averred that “INEC is probably relying on their 2015 guidelines which appear contrary to Constitutional provisions on this matter”. “It may make sense if the votes involved are in relation to centers were elections were not held due to no fault of the voters. However, were elections were held and votes are cancelled, they remain cancelled. They ought not to form part of the counting process and should not influence the outcome of the elections for any reason whatsoever. In Oshiomhole vs Osunbor & ords, cancelled votes were added to PDP’s scores. All the courts held that cancelled votes have no role to play in an election. The votes were deducted and Oshomhole was declared winner of the election. Why is INEC given so much priority to cancelled votes on this occasion?, the expert queried. Analysts say as battle field is now very narrow for both the PDP and APC, high level campaigns will kick off with the PDP having a wider opportunity. 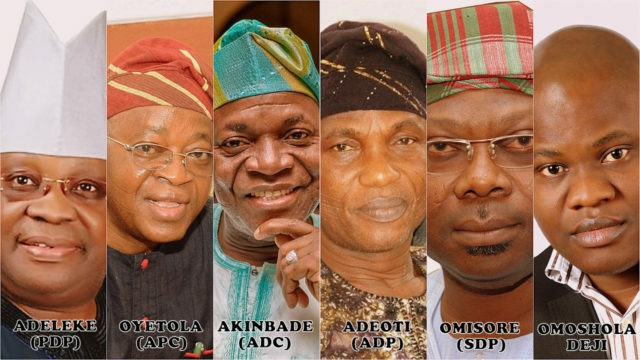 The opportunity, according observers comes from the possibility of exploring the advantage of the newly formed mega alliance called Coalition of United Political Parties (CUPP) which also has almost all the remaining leading parties that scored less in the Osun election as member. However, other pundits say the context of federal might and incumbency may also play better on the side of the APC depending on how it is handled within now and Wednesday evening ahead of Thursday’s rerun. Did NYSC Act permit Davido to leave state of primary assignment for Osun politics?